I began a project at the beginning of this year that I hope I never complete. I am wanting to read more and more from the Book of Psalms. While all of the Bible is God’s Word and is profitable for teaching, instruction, correction, and training in righteousness, there is an accessibility to the Psalms that is unsurpassed. Whether a person is reading one psalm a day or more, that book of the Bible provides lots of direction, consolation, and encouragement. On the one hand, there is the range of emotions and reactions of the psalmists, David and others. These verses range from exuberant joy in serving God to severe depression, fear, and questioning. Unlike the tendency toward the sentimental and syrupy in all too many modern songs and sentiments, the psalms are fresh, bold, manly, confrontational. They have more the feel of Aslan than a kitty cat; they are filled with roaring, not purring. The Psalms are also a prayer book. We all fall into mindless repetition or self-centered want lists in our prayers. On the one hand, God hears our stumbling prayers and the Holy Spirit corrects our spiritually mangled grammar and syntax. On the other hand, we need to pray more Biblically. The psalms are for praying. When the enemies assailing the godly in the psalms don’t sound like the particular battles we are facing, we need to realize that quite often the psalms are prophetically describing what Jesus actually experienced. The Book of Psalms in our Bibles may be several hundred pages away from the bitter details of Christ’s sufferings and death on the cross, but the experiences of the psalms are depictions (trailers, to use the movie term) of what Jesus endured on our behalf. The Psalms are a song book. For some churches and for many years, hymnals were Psalms recast into meter and music. We tend to have a few songs in our hymn repertoires that emerge from the Psalms, most often Psalm 23. But why do we not have 150 plus songs echoing the Psalms? The Concordia Psalter is a gem. It is a beautiful, handy, leather-type collection of the Book of Psalms. Each psalm is preceded by a few bars of music. I suppose the idea is to be able to chant the Psalms. We don’t generally quote Johnny Cash songs or Christmas carols; rather, we sing them. I like the idea of singing the Psalms. I reckon it would help us memorize the contents and internalize the words. There are also brief prayers at the end of each psalm. These prayers were compiled by the Reverend F. Kuegele. As part of my morning devotions, I was reading one or two psalms a day along with these heart-searching prayers. This book is perfect for mornings, evenings, family devotions, and other times we can carve out for hearing God’s Word. The book is just perfect for taking on a trip. It would also make a great gift. There are several plans given in the beginning of the book to show how the Psalms can read over 30 days or read over a two week period. The Psalter is the book of all saints, and everyone, whatever his situation may be, finds psalms and words in it that fit his situation and apply to his case so exactly that it seems they were put in this way only for his sake. As if this one new Psalter is not enough (God always overspends on our behalf! 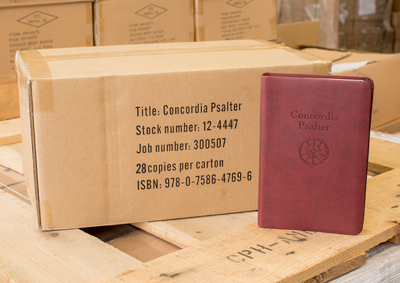 ), Premier Printing, LTD, out of Winnipeg, Manitoba, has published a beautiful edition titled New Genevan Psalter. This collection is a hymn book for singing the Psalms. The Psalms are recast into meter and expanded into verses with music for singing. I am still getting acquainted with this volume. But it doesn’t take much looking to see its worth. It, too, is a beautiful small book. (Books typically have aesthetic qualities.) This book is rooted in Calvin’s theology and labors to inculcate psalm singing in his congregation in Geneva. We have to remember that the Reformation was a revolution in church music as well as in theology. For more on this Psalter and the history and use of Psalms in worship and Christian living, take note of this blog by Dr. David Koyzis, who is both a Christian political scientist and a strong advocate of the Psalms. What is there now to do? It is to have songs not only honest, but also holy, which will be like spurs to incite us to pray to and praise God, and to meditate upon his works in order to love, fear, honor and glorify him. Moreover, that which St. Augustine has said is true, that no one is able to sing things worthy of God except that which he has received from him. Therefore, when we have looked thoroughly, and searched here and there, we shall not find better songs nor more fitting for the purpose, than the Psalms of David, which the Holy Spirit spoke and made through him. And moreover, when we sing them, we are certain that God puts in our mouths these, as if he himself were singing in us to exalt his glory. This can be found in Calvin’s preface to the Genevan Psalter he implemented in his congregations. So, Calvinists and Lutherans of the world unite: Let us sing, pray, and proclaim the Psalms. This entry was posted in Uncategorized and tagged Current Readings and Reviews, Readings for Ministry, Strong Coffee, Stronger Theology. Bookmark the permalink. Reblogged this on Book of Praise Bulletin Board. A very informative review of the NGP. Good for opening up the mind and concentrating it on the Lord our God.